We’re always looking for ways to make Rainbow Pro easier to understand and use, and in the just-released version 8.2 we’ve built on our “interactive reports” technology to deliver a whole new level of product integration. You can see this very clearly in the Summary Report screenshot above, showing the 20 interactive buttons (in column C and in row 26) which now take you directly to more detailed analysis of each item. So the Summary Report has now become an “information hub” from which you can simply click to view a whole range of different analyses. And we’ve still retained a pop-up comment behind each button to let you know exactly what it does. You’ll notice there’s also a Help window in the middle of the screen, called up from the Help button at the top right of the report. This is a feature we’ve now added to all Rainbow’s reports, so that if there’s anything in the report layout that isn’t quite clear, you can simply click the Help button and get an immediate answer. We’ve also made a few smaller changes to the reports, including a restrained dash of colour to make them easier on the eye. And in reports generated by the Risk Map function, we’ve added the colour for each potential risk so that you can use the Find Colours function to take you to the relevant cells in your spreadsheet. The one important Rainbow function where we couldn’t do any of this was the Logic Map – because this doesn’t generate a report. So instead we’ve created a Logic Colours dialog box that pops up automatically in the top right of your screen after you’ve run a Logic Map. As you can see, this is not only a reminder of the colours that Rainbow uses to show the five types of logical dependencies, but you can simply click any of the five buttons to find instances of the corresponding dependency in your spreadsheet. All this interactive technology requires certain Excel settings to be enabled for it to work, and in earlier versions of Rainbow you had to dig into Excel’s menu system to make this happen. In version 8.2 we’ve set up a system to handle this for you, which involves briefly closing and then re-opening Excel – all done automatically. Adding to the Clear Formats function so that it now deals with a wider range of formatting issues. 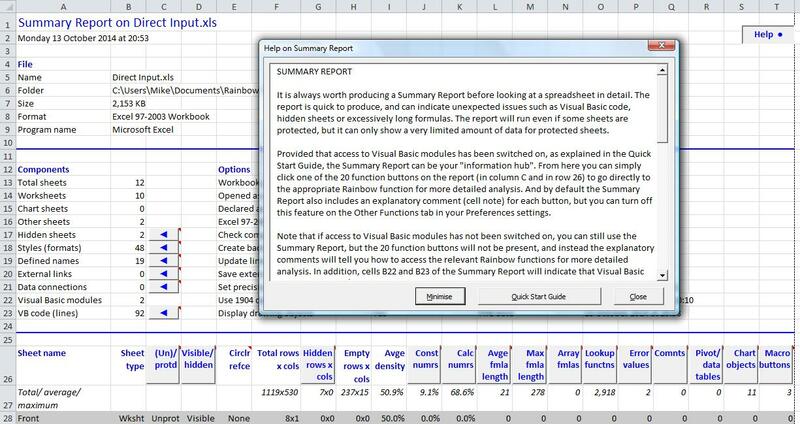 Resolving an issue that sometimes made the Summary Report function run less quickly than it should. Retaining the Rainbow log file until it reaches 50KB in size, instead of deleting it after a day. Moving the Find Colours dialog box to the top right of the screen (like Logic Colours). Improving the search information displayed by the Find Colours function (and also Logic Colours). Simplifying the system for reporting issues to our support desk. Altogether we think Rainbow Pro 8.2 is a significant step forward in usability and efficiency – and we hope you’ll agree! So if you haven’t already, why not visit our Installation page for a free 30-day evaluation copy?